Until the early 90s, most people had the naive belief that the worst movie of all time was Ed Wood's Plan Nine From Outer Space. It took the debut of Mystery Science Theater 3000 to disabuse people of that notion. Among the show's writers there was much debate over what was the worst movie they ever showed. One candidate was the caveman musical Eegah!, while another was Monster A Go Go (Spoiler Alert: There was no monster). 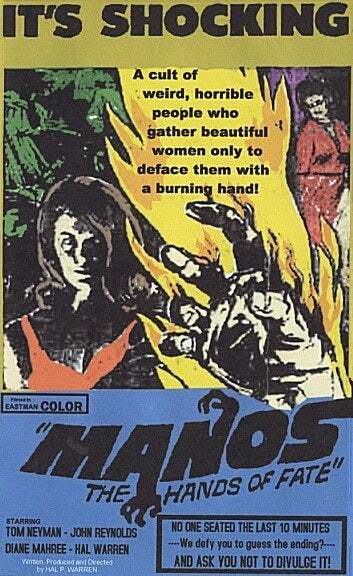 But among fans, there is only one choice: 1966's Manos: The Hands Of Fate. Manos: The Hands Of Fate was the brainchild (?) of Harold P. Warren, a fertilizer salesman from El Paso. Warren had been an extra on the show Route 66 and made a bet with the producer Stirling Silliphant that he could make a cheap horror movie. Warren did, but one wonders whether he should have. Manos follows Michael (Warren), his wife. Margaret (Diane Mahree), and their daughter Debbie (Jackie Neyman) as they travel to something called the "Valley Lodge." After driving rather pointlessly through the countryside, they stumble upon a house where they're greeted by Torgo (John Reynolds), a strange man dressed as a farmer with oddly shaped legs. (The idea was apparently that Torgo was a satyr, but as the production lacked any effects budget, Reynolds just walked funny). Torgo lets the family stay, but speaks cryptically of how "The Master wouldn't allow it." Soon, the family learns that "The Master" (Tom Neyman, a creepy Frank Zappa lookalike in red-and-black robes) is the leader of a bizarre cult (consisting of his many wives, all clad in diaphanous gowns) devoted to a deity known only as Manos. It seems that the price for staying at the house is eternal loyalty to The Master, although that will entail getting rid of one the older wives (I guess The Master can only have so many, but it's not exactly clear). The wives try to resolve this conflict via wrestling; meanwhile, Torgo wants Margaret for his own. Manos: The Hands Of Fate is almost Platonic in its awfulness. Warren went into the movie with no clue about professional film production, and used a 16mm camera that could only film for 30 seconds at the time. As a result, much of the footage is disjointed and repeats itself. The dialogue was all dubbed in afterwards by Warren and a few other actors, giving the whole thing a surreal sound. (The music is surprisingly elaborate, although often inappropriate; it often sounds as if an avant-garde jazz combo is playing just offscreen). The camera is rarely in focus, and in one memorable scene two cops decide not to investigate a far-off noise because the crew's lights couldn't reach that far. Under these circumstances, the actors could have all been Stanislavsky-trained and you could never tell; how do you judge the "performances" when the basic presentation of the sound and image is so distorted? Warren's world-building is not exactly rigorous, and there are so many questions that come to mind. For starters, why do The Master and his wives spend all their time in a ranch house in the middle of nowhere? Does Manos require of his followers anything more than just to hang out and light the occasional hand-shaped candle? What's with the two teenagers making out for hours on end? (Yes, I know the actress had a broken leg and couldn't leave the car; but what sense does it make in the story?) Why would anyone hire Torgo to take care of the house in the first place - why do they even need him? Following a disastrous premiere and a few drive-in showings around Texas, Manos: The Hands Of Fate languished in obscurity until a tape made it to the writers of MST3K. The Mystie-riffed Manos made its debut on January 30, 1993 and instantly became a fan favourite. The mix of creepiness and ineptitude was catnip for the show's fans. Even with riffs by Joel and the bots, Manos is still kind of creepy. While not exactly "found footage" a la the Blair Witch Project, it has such an ineptness that it almost seems sinister, like the home movies of the damned. Tom Neyman hams it up as The Master with such flair that even through the murk his eyes gleam with Rasputin-like mania. As well, John Reynolds, who would commit suicide months after filming, is bizarrely distant as Torgo - perhaps because he was allegedly tripping on LSD throughout the shoot. Thanks to MST3K, Manos: The Hands Of Fate has had a strange cultural impact. Jackey Neyman Jones, now a successful painter, has given interviews to several websites (Neyman Jones, who was crushed to hear her voice dubbed in by a grown woman, was one of the only two cast members to be paid; she got a bike. The other, the Doberman who played The Master's hellhound, got a bag of dog food. Everyone else was promised shares in the movie's profits) A documentary short called Hotel Torgo has been produced, and even Entertainment Weekly has done a feature on it. On a more bizarre note, an 8-bit style game for IOS is now available through the app store. Most amazing, however, is Ben Solovey's effort to restore the original film for release on Blu-Ray. http://www.manosinhd.com Having acquired the original workprint, Solovey digitally cleaned up the image and revealed that the movie, while still poorly made, nonetheless had been distorted by the videotaped version used for MST3K. Manos: The Hands Of Fate is terrible; I can't possibly imagine watching it without an assist from Joel and the bots. And yet it's still fascinating in a way that more respectable movies from 1966 are not. "The Worst Movie Of All Time" is a pretty bold claim, but after watching Manos, it's hard to imagine another contender.